The turkey vulture has many unique and interesting qualities that make this species one of the most fascinating birds in North America. Listed below are some of the reasons why turkey vultures are a favorite bird species of so many people! 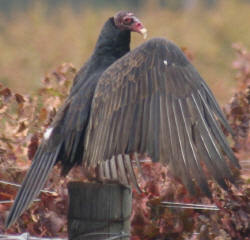 TURKEY VULTURE tidbits . . . . . The turkey vulture is in the same family (Cathartidae) as the California Condor (Federally endangered species) and the black vulture, which lives primarily in the south and southeast portions of the U.S. The turkey vultures scientific name is Cathartes aura which is Latin for "cleansing breeze". Like all other vultures, the turkey vulture has a bald head. This is so that bits of carrion (dead meat) do not adhere to the skin as they would to feathers. The Turkey Vulture, with its bald red head and dark feathers, was given its common name due to its superficial resemblance to the Wild Turkey. At close range the naked red heads of the adult turkey vultures resemble those of turkeys, hence the name. Juveniles have pinkish black heads. Turkey vultures are the only scavenger birds that can't kill their prey. 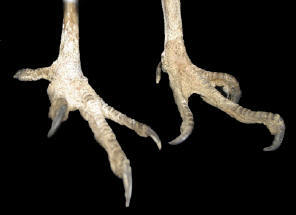 A close inspection of their feet reminds one of a chicken instead of a hawk or an eagle. Their feet are useless for ripping into prey, but the vultures have powerful beaks that can tear through even the toughest cow hide. They feed by thrusting their heads into the body cavities of rotting animals. Turkey vultures have an extraordinary sense of smell. They have been known to be able to smell carrion from over a mile away which is very unique in the bird world. The turkey vulture has the largest olfactory (smelling) system of all birds. Groups of perched vultures are called a wake. Imagine them mourning over something with their heads hung down. During the hot summer months turkey vultures will defecate on their feet to cool them off. If a turkey vulture is disturbed or harassed, it will throw up on whoever is bothering it. 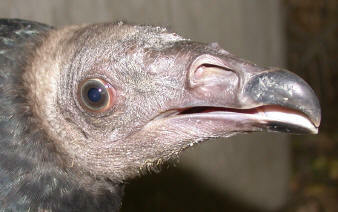 Even the vulture babies will do this! Turkey vultures do not actually build a nest. They are known to nest in very remote, hard to reach locations. Some of the strangest documented nest sites include the floor of an old neglected barn, 6 ft. below the ground surface in a rotted stump, and in a dead tree with the nest 14 ft. below the cavity entrance! Turkey vulture nests are very difficult to find - only one nest has been documented in the Kern Valley. Local researchers suspect that they may use jumbles of boulders for nesting areas. When you see turkey vultures swarming around in a cluster in the early morning hours of early spring or fall, they are preparing to continue on their migration. Vultures seen in the evening hours have probably arrived in the area that day and are preparing to roost for the night. Groups of vultures spiraling upward to gain altitude are called "kettles". As vultures catch thermal updrafts they take on the appearance of water boiling in a pot – hence the name kettle. Turkey vultures have been reported by aircraft pilots to rise to as high as 20,000 feet and soar for hours without flapping their wings. Researchers have determined that turkey vultures can travel at up to 200 miles in a day. They are known to arrive in the Kern Valley from the Fresno area and continue on the next day south to Tehachapi, Victorville or even farther. 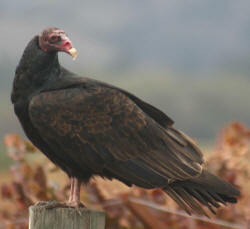 Turkey vultures rarely eat during their migration period. Turkey vultures average 2 1/2 feet with a 6 foot wingspan. In spite of their large size, they only weigh between 2-4 pounds! Because of their light weight, turkey vultures can virtually float in the sky using the thermal currents (rising columns of air) to get around the skies. This technique uses very little energy as the vultures rarely need to flap their wings. Because vultures are so efficient at finding thermals, hawks will look for kettles of vultures and then fly over to take advantage of the rising air. People will often mistakenly call turkey vultures, buzzards, which is the British name for certain hawks. 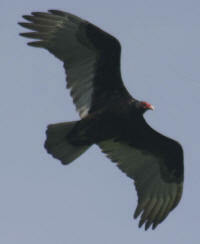 Turkey vultures have been known to live up to 24 years. The average age is guessed to be around 20 years. Audubon is dedicated to protecting birds and wildlife and the habitat that supports them. Our national network of community-based nature centers and chapters, scientific and educational programs, and advocacy on behalf of areas sustaining important bird populations, engage millions of people of all ages and backgrounds in positive conservation experiences.